We're a bit BAN-anas when it comes to architect Shigeru Ban so when we heard that he was finished with the Camper store - his first retail project in the United States - we knew we had to check it out in person. The eye-catching shoe store lends a pop of red color to the corner of Prince and Wooster streets in New York City and is topped with an angled roof made of Ban's signature paper tubes. Inside, the "House of Shoes" looks more like a MoMA exhibit than a footwear purveyor, featuring a giant logo wall that hides hoards of sandals, flat and loafers behind it. Check out our photo gallery to see the pics we snapped of SoHo's most unexpected new retail space. 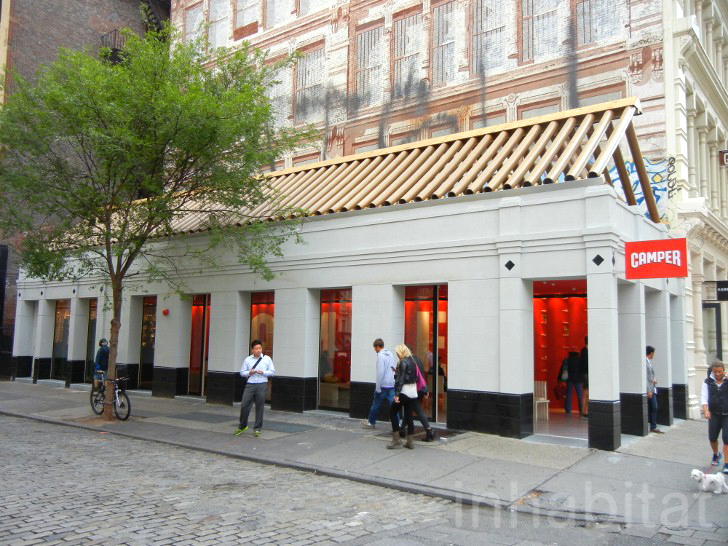 Shigeru Ban Architects completed the new Camper shoe store with the help of New York-based Dean Maltz Architects. The design has a decidedly “Ban” feel to it – particularly the pitched cardboard tube roof, which we thought looked a bit like the Christchurch Cathedral’s, except flattened out a bit. The playful detail certainly helps to differentiate the renovated space from the other flat-topped stores in the area, especially since its idyllic feeling plays nicely against some leftover graffiti on the neighboring wall. At first glance, it’s difficult to tell that the red-emblazoned space is a shoe store since most of the merchandise is stowed away behind a clever storage wall that we wish we had in our own tiny NY apartments. When entering the shop, all customers see is the Camper logo, but once they reach the center, the wall reveals its secondary purpose. Ban fans might also recognize the seating in the store as his 10 Unit System, made by Artek. We’re not gonna lie – our hearts skipped a beat momentarily when we saw the greenery-enveloped cashwrap…until we realized that it was faux. Still, it was a nice touch in this simultaneously playful and high-end retail experience. Shigeru Ban Architects completed the new Camper shoe store with the help of New York-based Dean Maltz Architects. The design has a decidedly "Ban" feel to it - particularly the pitched cardboard tube roof. We thought the roof looked a bit like the Christchurch Cathedral's, except flattened out a bit. The playful detail certainly helps to differentiate the renovated space from the other flat-topped stores in the area. Especially since its idyllic feeling plays nicely against some leftover graffiti on the neighboring wall. At first glance, it's difficult to tell that the red-emblazoned space is a shoe store since most of the merchandise is stowed away behind a clever storage wall. But once they reach the center, the wall reveals its secondary purpose. A closer look at the space-saving shoe wall. How we wish we had the same solution in our own tiny NY apartments. Ban fans might also recognize the seating in the store as his 10 Unit System, made by Artek. A closer look at the 10 Unit System chairs. Lastly, our hearts skipped a beat momentarily when we saw the greenery-enveloped cashwrap until we realized that it was faux. Still, it was a nice touch in this simultaneously playful and high-end retail experience.